A view of flooding on the west side of Houston on Sept. 1. 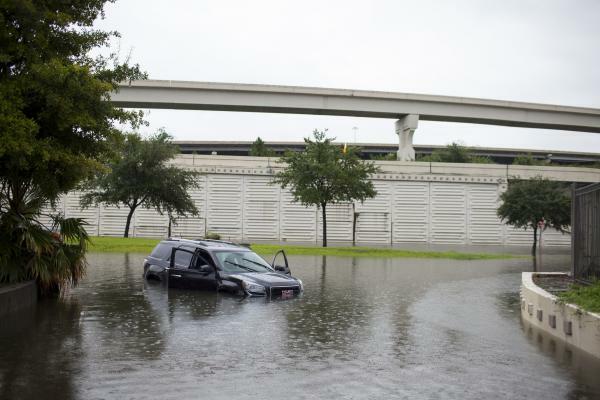 A car is left stranded in Houston on Aug. 27. 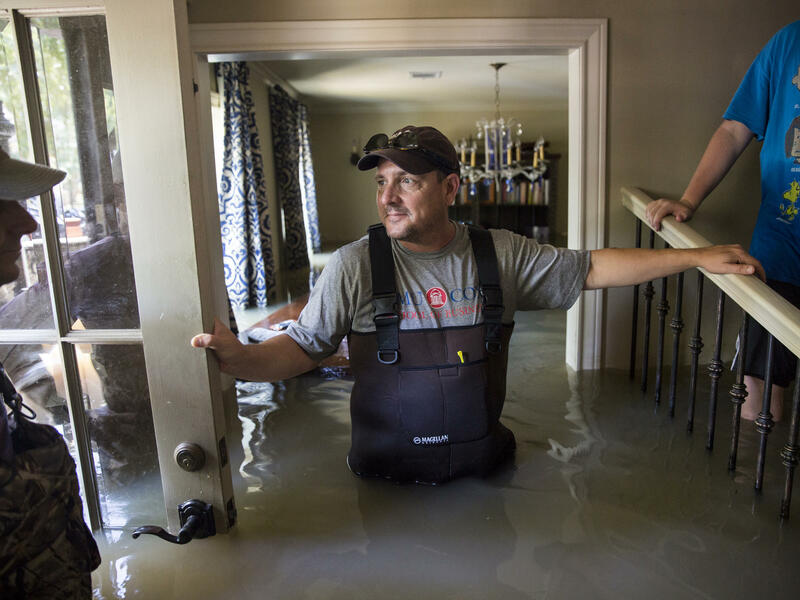 Ray Blanchette stands in his flooded home in the Nottingham Forest subdivision of Houston on Aug. 31. Residents can't begin to assess the damage to their homes and businesses until they can get to them, and many local roads and main thoroughfares remain flooded or closed owing to storm damage. Even those that are now dry have to be inspected for possible damage and may need some repairs before they can reopen. Texas Gov. Greg Abbott said Tuesday that while all the interstate highways are now open, at least 118 other roadways remained closed because of high floodwaters, and with continuing releases of water from reservoirs into overflowing rivers and bayous, some roads may remain closed for a couple of weeks. On many of the roads and highways that are open, traffic signals are out and lane restrictions may be in place. And that is causing brutal traffic jams as many area residents began trying to return home or get back to work this week, while often needing to take alternative routes. "Traffic is going to be heavy and somewhat confusing," Houston Mayor Sylvester Turner told reporters Wednesday. "This is going to be the roughest week," he added. "I certainly would encourage people to be patient." How well the concrete and asphalt held up under the floodwaters depends in part on the type of road it is, what level of traffic it was designed to handle, how long it was underwater and what kind of shape it was in before the storm, says David Newcomb, a research engineer at the Texas A&M Transportation Institute. Interstates, he says, should fare pretty well, while "lower-volume roads are going to be weaker." Newcomb adds that "the longer the water stays on the road, the greater the opportunity for it to seep in the ground, and it could leave the soil in a weakened state." The Texas Department of Transportation has 2,400 employees in the region assessing damage and addressing highway and traffic problems. Bridge and highway inspectors "will be looking for [signs of scouring] underneath bridges, spots on the road where erosion might have occurred around culverts," and similar signs of flood damage, says Newcomb. Even if some roads appear to be in relatively good shape after the water recedes, the wear and tear from bigger trucks carrying heavier loads to help in the recovery is likely to cause additional damage, says Newcomb. "There's going to be a lot of heavier trucks, dump trucks," and other heavy vehicles helping remove debris and bring in materials to rebuild homes. "That's more traffic and larger loads than you'd normally see on residential streets." It's not yet clear how long some roads and highways in and around Houston and elsewhere in South Texas may be closed, but Newcomb says repairing all the damage "will take a long time." "Funding won't be available to fix all of them at once," he says, "so I foresee this going on for years in terms of getting highways back to the condition they were before the storm." The biggest challenge for Houston is temporary housing. Those evacuated from their homes have been leaving the temporary shelters set up around the area, but many will be unable to return to their homes for months, maybe even years. FEMA has placed 56,000 people in hotels, paid for by the government; thousands of others are staying with friends and relatives. The agency is considering longer-term solutions, including mobile homes. The shelter at the city's convention center, which at its peak housed about 10,000 people and now has about 1,600, will very likely remain open until the end of next week, Turner said in an interview with PBS NewsHour Wednesday. But he notes that those still in the shelter likely have few — if any — other options. "It is the hardest population to place," he said, adding that the city is working on developing a longer-term housing plan for those displaced by the storm. "We want to try to provide the most suitable placement for them ... and put forth a transitional housing plan that meets the needs of individuals and the families." "For those who were homeless prior, we'll look for shelters in other areas. But the goal is not to increase the population of people who are homeless on our streets that existed prior to the storm." Once residents can get back to their homes, there's the task of getting rid of water-soaked mattresses, couches and other damaged furniture, plus ruined appliances and other items inside their flooded homes. Then there's the flooded carpeting, moldy drywall, damaged floor tiles and other debris, not to mention downed trees, damaged shingles and junk that may have just floated into their yards. The city of Houston estimates it will remove more than 8 million cubic yards of hurricane debris and flood-related trash at a cost of more than $200 million. Harris County has not yet disclosed figures, but FEMA estimates the county and all the cities in it spent $242 million removing debris after Hurricane Ike and that this will far surpass the totals from that 2008 storm. "We're going to pick it up, and we're going to operate with the highest degree of urgency," Turner said. But he acknowledges it will be a "herculean" task to get rid of all the debris and will probably take months. Asked about debris removal at a press conference Wednesday, Gov. Greg Abbott said "we want to get it removed as quickly as possible," adding that FEMA is providing funding to speed up the removal process. The mayor says there are public health concerns about piles of flood debris in city neighborhoods, and if it takes too long to remove it, there could be a negative psychological impact on residents. How successful the city is in responding to the hurricane is "going to be determined by how quickly we can move that debris from in front of their house," Turner said. "Because that will be a constant reminder of this storm." Harris County Judge Ed Emmett agrees. "Everybody is fully aware that people want to get on with their lives," he said. "That's real difficult to do if you have a whole mountain of debris sitting in front of your yard." Once the water recedes and residents can get inside their homes, the next challenge is assessing the damage and determining whether the home is salvageable. The city of Houston estimates 126,000 homes were "severely impacted" by Harvey and the subsequent flooding. There are tens of thousands more homes across South Texas that were damaged or destroyed, but it is far too early for authorities to determine how many of those homes will be inhabitable. The first thing to do is to check the structural integrity of the home, says Norma Jean Mattei, a professor of civil engineering at the University of New Orleans and president of the American Society of Civil Engineers. She says unlike the flooding from levee breaches in her city after Katrina, "where it was like a bathtub filling up slowly," Harvey floodwaters appear to have risen fast. "More of the structures were closer to high-velocity water, those channels, flood control canal, a bayou or a creek," says Mattei, who teaches structural design and analysis. "If it was really close to fast-flowing water, then some of those structures are going to have foundation issues, possibly." "If there is some significant foundation damage, that then would be more likely to require replacement instead of just gutting, drying out and repairing," she adds. Those homes that can be repaired, Mattei and other experts say, might have to have walls and insulation ripped out and the house stripped down to the studs, which then will need to dry out. Depending on how high the water was and how long a home remained flooded, water can soak up into and rot drywall, it can ruin insulation and electrical systems and it can swell or warp wooden floors, doors and trim. There could be dangers lurking in your home, even after the floodwater recedes, says Steve Cain, a disaster specialist at the Purdue University Extension. "You don't want to be rushing into your home after a flood," Cain told The Associated Press. "You can fall through a floor, gas lines could be leaking, electrical systems can be damaged and if the electricity is not shut off, you could get electrocuted. ... You want to make sure you go back when it's safe." Families are going to need help assessing their homes, says Mattei, who did a lot of pro bono structural assessments of homes after Katrina. "Giving those families the information they needed to make a decision — do we eliminate the house and start from scratch or do we gut this thing and put it back together as is ... that can be very helpful," she says, especially considering that many homeowners will be shell-shocked when they see the damage. "They're walking into a house and they've lost everything." There's some question about whether some Houston-area residents should be allowed to repair or rebuild the most severely flooded homes and apartment buildings at all. Harvey is the third major flood in three years in Houston, so many homes have flooded previously. Some had recently completed repairs to their homes from flood damage caused by the April 2016 "Tax Day" floods, and some flooded the year before that. The city's somewhat unregulated development has been widely criticized as a possible contributing factor to the scope of Harvey devastation. 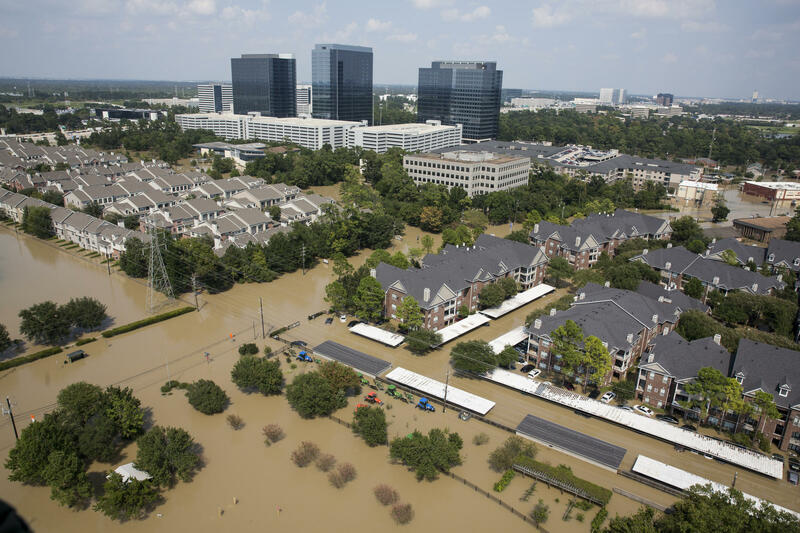 Thousands of homes and many multifamily complexes have been built, and many of them were rebuilt in flood plains near Houston's reservoirs, creeks and bayous. Some engineers, urban planners and other experts say it's time to stop building and rebuilding homes where flooding is likely to happen again. "We certainly shouldn't be doing any building in flood-prone areas and we should be very careful about building in areas along the bayous," Turner told PBS NewsHour. "We will continue to grow and continue to develop, but we will do it in a very smart and intelligent way. We certainly can take definitive steps to minimize the risk of flooding. We just can't continue to do things as we've always done it and expect a different result," he said. The mayor told reporters Wednesday that the city has started conversations with FEMA about buying out homes and apartment complexes "that are in the flood plain and have flooded repeatedly." But when it comes to apartments in particular, he says "one of the reasons why those housing units keep getting rehabbed is because there's not sufficient affordable housing [available]." So buying out those properties would require affordable rental housing to be built elsewhere. If the government doesn't buy out flooded homes, those wanting to rebuild may have to meet new FEMA codes or flood control elevations, says Mattei. She says FEMA did just that in and around New Orleans and all along the Mississippi and Louisiana coasts. "So therein lies the ability to change how neighborhoods are rebuilt if you're in an area that really had a high level of flooding," she says. But she adds a few words of caution: The recovery is going to be a long, and at times frustrating and painful, process. "It's going to take a while for Texas to recover from this historic event," and one of the biggest lessons learned in New Orleans after Katrina is the need for patience above all else, says Mattei. "The damage may have occurred very quickly but the recovery is going to take a while, and you just have to have patience."